Google today released an update to its Google Calendar iOS app that brings full iPad support. The app has been optimized for all iPad sizes, including the 12.9" iPad Pro, and it launches with Split View support. The app is very simple, but attractive. 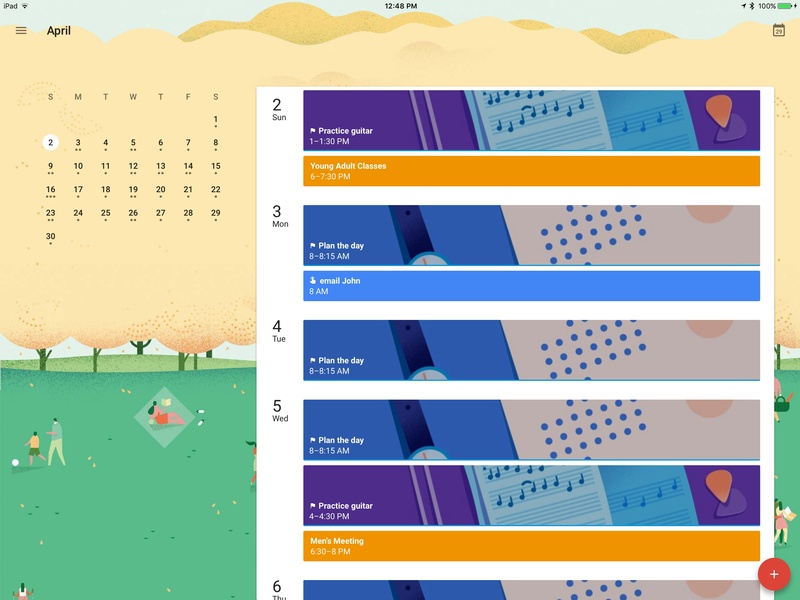 Beautiful illustrations line the background of the calendar, with a different illustration for each month of the year. Hitting the red plus button to add a calendar event provides the option of creating a Goal or Reminder rather than a traditional event. The navigation menu includes a settings button, several different calendar view options, a search function, and a list of all available calendars that you can turn on or off. That's it. There's not much to explore, but then again, maybe that's okay for a calendar app. On its blog Google states that more improvements to the app will be coming soon, specifically mentioning an upcoming widget that will enable quick viewing of future events.